So today was day one of doing something different with Iris. I had promised her last night that today we could have special mama and Iris time, an idea she seemed really excited about. We got up, got ready and went to a friend's first birthday party. We had a good time but there were ALOT of people there, most of whom we don't know. I think Iris and I were both a little overwhelmed, although those types of situations seem to be great for Matt and Eloise. After the party I went to yoga and then, finally, it was special mama and Iris time! I didn't feel terribly creative and the weather was crummy, so I suggested we go to a coffee shop. Iris loves coffee, so she thought that sounded good. 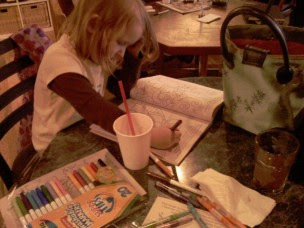 She had mentioned wanting to color, so I packed up a few crayons and a few pieces of paper. As we got in the car to leave I thought maybe a fun part of our special time would be picking out a new coloring book, so off we went to do that. We also ended up picking out some other crafty supplies, which is great since we need more of that kind of stuff. After the store we drove over to Mr. Spots Chai House and found a nice high table to hunker down at. I ordered myself a chai cider and Iris a hot chocolate. I've been ordering her hot chocolate lately because she always requests whipped cream and that's one drink it comes on. We both got something to eat, as well. The coloring and chatting began and we really had a great time! On the table you can see our drinks, the markers and crayons, Iris's purse and the Cinderella coloring book she picked out. What you can't see is that her shirt says "my mama is blogging this". She dresses herself 100% of the time now and is currently big in to layering short-sleeved shirts over long-sleeved shirts. All in all, it was such a treat to spend time with her alone. When we got home Matt and Eloise were dressed up all crazy and reported they had been dancing to music while we were away. Sounds like everyone had some fun one-on-one time! Tonight we also gave the girls a bath separately. It actually went completely smoothly! Matt and I both spent time alone with each girl bathing and playing with them. There were no tears, no screaming, no kicking/hitting/pushing. Sometime soon Matt and I are going to formulate a plan for having a unified and consistent approach to discipline for Iris. That's just one more of our many goals. I feel so revitalized after today, though, I'm really excited about everything! Good job getting help and using it. Your time with Iris sounds perfect.